To roast garlic, slice off the top head of the garlic to expose some of the cloves. Place garlic head on a piece of foil and drizzle with 1 teaspoon of oil. Wrap in the foil and roast in the oven for 30 minutes. Once the garlic has cooled, remove the skins. While garlic is roasting, caramelize the onions by heating a medium-size pan over medium-low heat. Add 2 teaspoons of oil, then add onions. Cook for 20-30 minutes until golden brown while stirring periodically. While onions are caramelizing, toss tomatillos and whole peppers in 1 tablespoon of oil in a bowl. Place them on a sheet pan with at least a 1/2 inch edge. Roast for 20 minutes. Turn peppers and tomatillos over after 10 minutes of cooking. Once the peppers have cooled a bit, make an incision lengthwise. Cut off the stems and scrape the seeds out with a spoon. 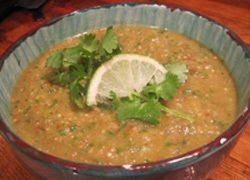 Combine the garlic, tomatillos, peppers, onions, cilantro, lime juice and salt in a blender and pulse for 3-4 seconds. Serve in a dish garnished with a wedge of lime and fresh cilantro. Copyright 2010, S. Nester, original recipe.